Celebrated at City Center, October 11 - 23, with Two World Premieres and Dances from Four Decades, Set to Music Ranging from Debussy to "I Like Bananas Because They Have No Bones"
With Paul Taylor everything that goes around comes around–brand new. 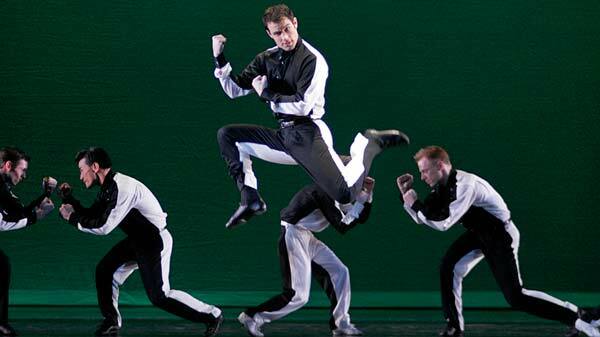 The contagious energy, romance, wit, darkness, and explosive originality of Paul Taylor will be out in full force when the Paul Taylor Dance Company takes over the City Center stage for its 40th anniversary celebration, October 11-23. There will be two dramatically different world premieres – “Moonbine” and “Funny Papers,” plus seven revivals dating back to 1962. Donald York will conduct the orchestra. First about the world premieres: Set to “Sonata for Viola, Harp and Flute,” one of Debussy’s last compositions, “Moonbine” reflects the master of surprise at his most unexpected. As the mood shifts almost imperceptibly from sunny innocence to chilling darkness, the dance suggests the irresistible power of fate and the randomness of luck. In contrast is “Funny Papers.” Based on existing choreography by company members Sandra Stone, Mary Cochran, Hernando Cortez, David Grenke, Andrew Asnes and Patrick Corbin, and amended and combined by Taylor, the resulting world premiere is dedicated to: “all those who, before reading front page news, turn to the funnies first.” “Funny Papers” is danced to various novelty tunes including “Alley-Oop,” “Itsy Bitsy, Teenie Weenie Yellow Polka Dot Bikini,” “Does Your Chewing Gum Lose its Flavour (On The Bedpost Overnight)” and “I Like Bananas Because They Have No Bones.” Santo Loquasto is designing costumes for both premieres and Jennifer Tipton the lighting. The revivals will feature the romantic purity of Taylor’s 1962 hit “Aureole,” a dramatic contrast to the horrifying portrait of the American family presented in his 1970 classic, “Big Bertha”. Among the other revivals will be the sweetly poignant and witty “Diggity” (1978), with its 24 metal cuts-outs of dogs by Alex Katz, the wildly antic “Minikin Fair” (1989) as well as “Sunset,” Taylor’s 1983 haunting evocation of love and loss. The season will also feature the galvanizing non-stop movement of “Syzygy” and “Profiles,” whose archaic, sculptural shapes were first seen in 1978. Completing the City Center repertoire will be Taylor’s great masterpiece from 1975, “Esplanade” and last year’s two hits. “A Field of Grass,” the suite of dances set to Harry Nilsson songs from the ’60’s and ’70’s, suggests the innocence and experience that characterized the world of flower children. Also from last year will be “Spindrift,” a dance resonating with poetic power. The company includes (listed according to seniority): Sandra Stone, Mary Cochran, Joao Mouricio, Francie Huber, Hernando Cortez, David Grenke, Andrew Asnes, Thomas Patrick, Denise Roberts, Caryn Heilman, Patrick Corbin, Rachel Berman Benz, Lisa Viola, Angela Vaillancourt, Edward Talton-Jackson, Richard Chen See, and Kristi Egtvedt. After the City Center season, the Taylor Company will be seen in New Bedford, MA on November 1, in Portsmouth, NH on November 3, and at the Tillis Center for the Performing Arts in Brookville, NY on November 5. The company will appear in Willmington, NC on November 8 and in Chapel Hill, NC on November 10. before heading for Europe for performances, November 29-December 14. On January 14 the company will be seen at the Performing Arts Center in Purchase, NY and then will spend several weeks in Japan where it will perform in Tokyo (January 25-29); Osaka (January 31) and Kyoto (February 1). San Jose is next, where the troupe will appear at the San Jose Performing Arts Center, February 10-12. The Company’s March tour will include performances in Henderson, KY (March 16), New Orleans, LA (March 18), Los Angeles, CA (March 24 & 25), Lancaster CA (March 27), and Tucson, AZ (March 29-31). From April 1-3, the Company will dance in Scottsdale, AZ and then in Poughkeepsie, NY (April 8). Curtain times for the City Center season are 7pm on opening night. Evening performances Tuesday- Saturday are at 8pm; Sundays are at 7:30pm. The Saturday matinees are at 2pm and the Sunday matinees are at 3pm. Tickets range between $15 and $42, and can be purchased by phone by calling 212-581-1212. The City Center box office is located at 131 West 55th Street between 6th and 7th Avenues. Photo by Paul B. Goode.